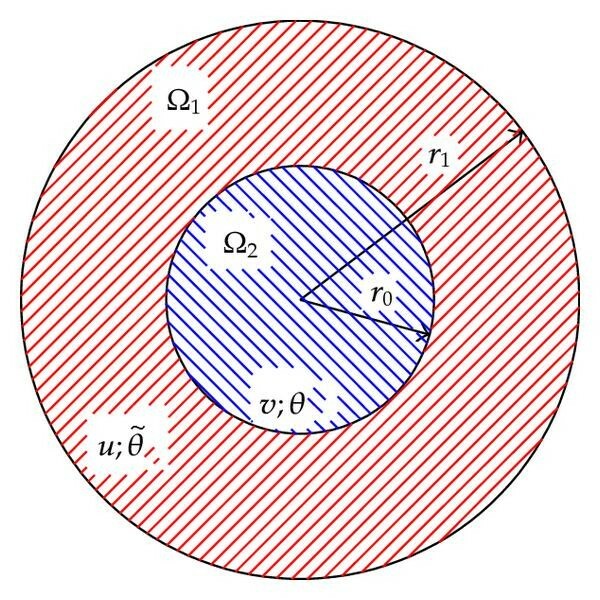 We show that the energy to the thermoelastic transmission problem decays exponentially as time goes to infinity. We also prove the existence, uniqueness, and regularity of the solution to the system. We denote by a point of ( ) while stands for the time variable. The displacement in the thermoelasticity parts is denoted by , ( , ) and , ( , ), , and is the variation of temperature between the actual state and a reference temperature, respectively. , are the thermal conductivity. All the constants of the system are positive. Let us consider an -dimensional body which is configured in ( ). where , ( ) are the Lamé moduli satisfying . Domains and and boundaries of the transmission problem. The transmission conditions are imposed, that express the continuity of the medium and the equilibrium of the forces acting on it. The discontinuity of the coefficients of the equations corresponds to the fact that the medium consists of two physically different materials. In spite of the obvious importance of the subject in applications, there are relatively few mathematical results about general transmission problem for composite materials. For this reason we study this topic here. This paper is organized as follows. Before describing the main results, in Section 2, we briefly outline the notation and terminology to be used later on and we present some lemmas. In Section 3 we prove the existence and regularity of radially symmetric solutions to the transmission problem. In Section 4 we show the exponential decay of the solutions and we prove the main theorem. For a nonnegative integer and , we denote by the Sobolev space of functions in having all derivatives of order belonging to . The norm in is given by . with norm , with norm . We write for the space of -valued functions which are -times continuously differentiable (resp. square integrable) in , where is an interval, is a Banach space, and is a nonnegative integer. We denote by the set of orthogonal real matrices and by the set of matrices in which have determinant 1. The following results are going to be used several times from now on. The proof can be found in . where , for some functions , , , and . The following straightforward calculations are going to be used several times from now on. Throughout this paper is a generic constant, not necessarily the same at each occasion (it will change from line to line), which depends in an increasing way on the indicated quantities. In this section we establish the existence and uniqueness of solutions to the system (1.1)–(1.13). The proof is based using the standard Galerkin approximation and the elliptic regularity for transmission problem given in . First of all, we define what we will understand for weak solution of the problem (1.1)–(1.13). The existence of solutions to the system (1.1)–(1.13) is given in the following theorem. The existence of solutions follows using the standard Galerking approximation. for almost all , where , , , and are the zero vectors in the respective spaces. Recasting exactly the classical Faedo-Galerkin scheme, we get a system of ordinary differential equations in the variables and . According to the standard existence theory for ordinary differential equations there exists a continuous solution of this system, on some interval . The a priori estimates that follow imply that in fact . The system (1.1)–(1.4) is a linear system, and hence the rest of the proof of the existence of weak solution is a standard matter. which implies that , , , and . The uniqueness follows. Finally, our conclusion will follow by using the regularity result for the elliptic transmission problem (see ). To obtain higher regularity we introduce the following definition. Using the same arguments as in Theorem 3.2, the result follows. In this section we prove the exponential stability. The great difficulty here is to deal with the boundary terms in the interface of the material. This difficulty is solved using an observability result of the elastic wave equations together with the fact that the solution is radially symmetric. In a similar way we obtain (4.2). where , and are positive constants. with , where is a ball with center and radius . where , , and are positive constants and , . with ; there exists a positive constant which proves (4.51). where and are positive constants. From the above two inequalities our conclusion follows. This work was done while the third author was visiting the Federal University of Viçosa. Viçosa, MG, Brazil and the National Laboratory for Scientific Computation (LNCC/MCT). This research was partially supported by PROSUL Project. Additionally, it has been supported by Fondecyt project no. 1110540, FONDAP and BASAL projects CMM, Universidad de Chile, and CI2MA, Universidad de Concepción. where is a symmetric set of . Replacing in (A.6) the result follows.